The hedge fund war over Herbalife keeps heating up. Right now, shares of Herbalife are trading back below the pre-Bill Ackman short levels. Ackman, who runs $12 billion Pershing Square Capital Management, believes the multi-level marketing firm that sells nutrition products is a “pyramid scheme” and he’s shorting more than 20 million shares with a price target of $0. Last Thursday evening, legendary billionaire investor/long time Ackman rival Carl Icahn disclosed a 12.98% stake in Herbalife which includes shares underlying call options. 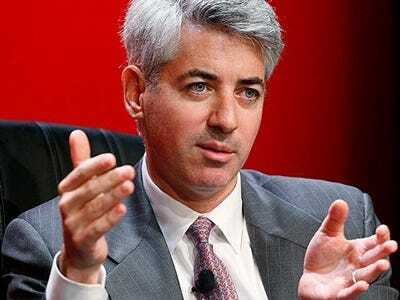 That news caused the stock to spike more than 18% – way above the pre-Ackman short level. The next day, Icahn appeared on CNBC in a live telephone interview around 12:30 p.m. to talk about his stake. He told CNBC that he thinks Herbalife is a “very undervalued situation” and that his stake is not a personal vendetta against Ackman, but rather it’s about making money. During his appearance, the stock started to slip, but was still up on the day. The stock ended up closing up 0.47 cents, or 1.23%, at $38.74 per share on Friday. The stock is up slightly in the pre-market today. Meanwhile, some fund managers on the long side have been selling off their stakes. Activist investor Bob Chapman, who runs Manhattan Beach, Calif.-based Chapman Capital, said he completely exited his long position in Herbalife Friday morning after Icahn disclosed his stake. Hedge fund hot-shot Daniel Loeb, who runs Third Point LLC, is also said to have been paring back part of his big long position over the last few weeks, CNBC’s Scott Wapner reports citing a source. He’s still one of the biggest shareholders, the report said. 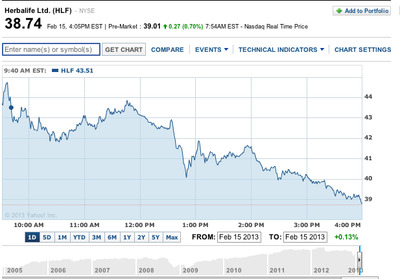 Since December 18, the trading session before Ackman confirmed his short position, shares of Herbalife are off 8.85%. However, since the beginning of 2013, the stock is up more than 20%. Herbalife is also expected to report Q4 earnings today after the closing bell.